Statistically, I don’t know whether or not February has been Houston’s cloudiest month on record, but I think we all know it has to be close. Yes, we’ve had sunny periods at times, but they’ve been short-lived and fleeting. I’m not sure what the exact number is (we’ll probably tally it for you at the end of the month), but roughly 70% of the month appears to have had some level of overcast cloud cover. February averages somewhere around 45% cloud cover in Houston. Sunny weather will return eventually. That much we promise. Low clouds and fog are pretty prevalent this morning as this pesky front we’ve been dealing with begins to try and advance back north. Temperatures are all over the place, but it’s pretty easy to see the front. The front has made it back to almost US-59. 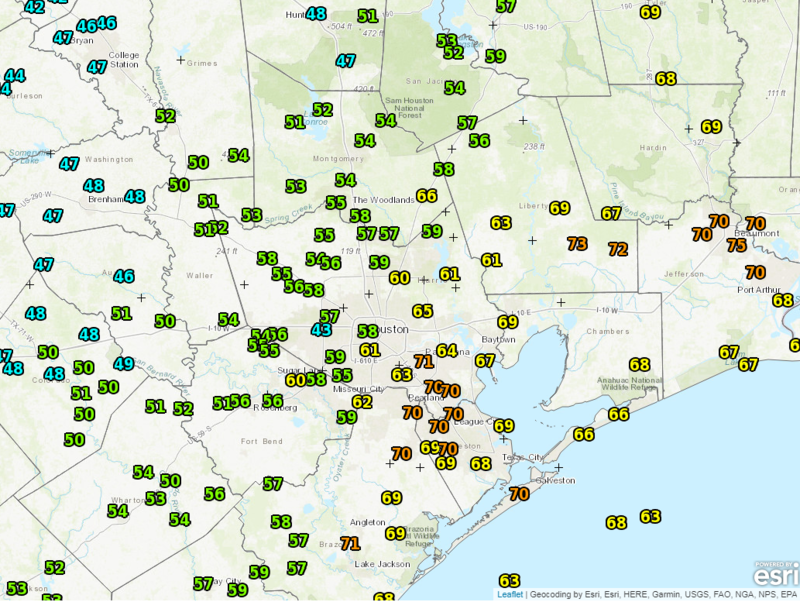 It’s in the 70s in southeast Houston, but 50s on the west and north sides. As the front pushes back north and west today, expect warmer, more humid air to win out just about everywhere. Low clouds and fog should gradually lift, but it may be a process in spots, meaning clouds and drizzle could mar a good chunk of the day. Folks well north and west of Houston may have the most trouble getting warm and clearing at all today. 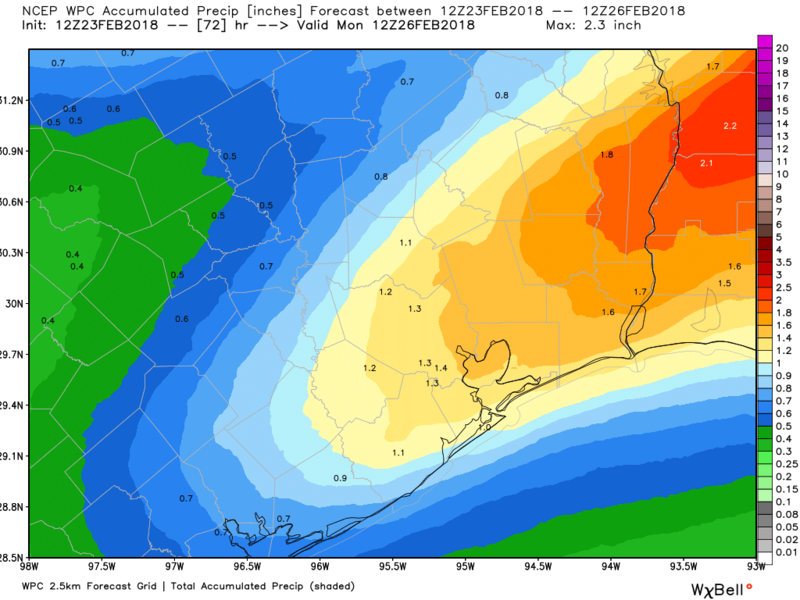 Disturbances will continue to push through, but the heavy rain should stay oriented well to our north, where 1-3″ will be possible north of Waco and across the DFW Metroplex. Temps will top off in the mid or upper 70s southeast of Houston, perhaps near 80 with some sunny breaks. Northwest will probably see low-70s or so on average (warmer closer to Houston, cooler further away). Saturday will likely behave somewhat similar to Friday afternoon with an isolated shower, but mostly just AM clouds or fog, some sunny breaks, and humidity. Folks way north of Houston, such as up toward Huntsville, could see a little steadier rain Saturday morning. Again though, the bulk of the rain will stay well north. With any sunshine, we’ll easily scoot above 80 Saturday, but otherwise it’ll be upper 70s. The front comes back at us tomorrow evening as a cold front. The good news is that while we should see some showers and perhaps a thunderstorm Saturday evening, it shouldn’t be anything too serious. Right now, I’d be on the lookout for that between 4 and 8 PM, maybe a little a later southeast. And any heavier rain you see will probably be brief. The front should get to the coast around Midnight, and that’s where it will likely halt. As it does so, another disturbance rides along the front late Saturday night into Sunday. This brings rain and a chance of thunderstorms to most of the area on Sunday. I don’t want to term it a total washout, but a couple models we look at say it will probably be just that. So for outdoor plans, Saturday’s your better day it would appear. Sunday’s rains should tally up to 1″ or 1.5″ on average. The heaviest will scoot into Louisiana, but rains should be respectable around Houston too. Sunday’s temps will be variable. Well northwest of Houston, it should be in the 50s much of the day Sunday. In and around Houston, we’ll probably stay in the 60s most of the morning and early afternoon and slowly drop toward evening. I think we might have the end of this rainy, dreary pattern in sight. Behind Sunday’s rain, look for Monday to start off cool in the 40s or lower 50s, and it will finish around 70° or so. And we may actually have a good bit of sunshine too! Monday actually looks like a terrific early spring day in Houston right now. Tuesday should see onshore flow return and a burst of showers and storms in the morning or early afternoon, before warmer and more humid air rushes back in. That sits with us Wednesday and probably Thursday. Our next front should arrive sometime Thursday. This one looks like the best chance to get offshore in a big way. That would lead to seasonably cool and perhaps stellar weather next weekend. Fingers crossed. More on that for you next week. February 2018 has reminded me of January 1977, when it seemed as though there was barely one hour of sunshine the whole month. When you use the term ‘whether’, that is good enough. You should not add ‘or not’ after it because it is superfluous. Thanks for your outstanding weather data. REALLY? Ease up why don’t you! We come here for Eric and Matt’s views on whether, not yours. And occasionally Braniff’s. I understand Ellington scrambled an F-16 to investigate it. But then the object was lost above the clouds. So the F-16 was disintegrated by a Martian death ray? Whether meteor or Martians, this does not look good.